Kafui Esi Adjei is a regular contributor to theBlog. She is married to Emmanuel Adjei, whose construction company is building the Ghana FFP facility. Kafui and Emmanuel have three children. She is the Managing Director of Kasie Enterprise, producers of concrete products. 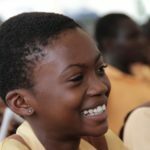 Living in Accra, Kafui is a teacher by profession and loves cooking and gardening. 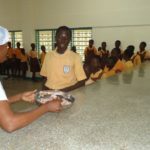 In this recent interview, she brings us up to date on the status of the FFP project in Ghana, West Africa. In our last construction update, Emmanuel reported that the foundation stage was complete. What has happened since? KEA: I am happy to say that structural construction is now 90 per cent complete. In the next three weeks, the crew will install roof trusses and complete the roofing system. This means the shell of the building will be 100 percent built out. In order to meet construction deadlines, the team is not waiting for the roof to be in place before they complete the interior finishes (plastering, floor finishes, etc.) All of the interior and exterior plastering of the main building is finished except for a few trimmings to the concrete pillars and beams. These will hopefully be completed in about seven days. The floor concrete has been laid and the terrazzo floor finishing will be starting on November 1st. The team has installed most of the plumbing and electrical conduits. Electrical cabling will start soon. The perimeter fence is up and fence plastering is 70 percent complete. External finishes such as the driveway and parking lot are under way. Landscaping will begin in the next two weeks. KEA: Once the roof is installed, we can begin to purchase and install the kitchen equipment and complete the other interior finishes. I can tell you that Bobby Hendry, our food services manager, visited recently, and he is planning for us to serve the first lunch just before Christmas on December 22nd. Then, the staff will break for the holidays, and we plan to begin serving regular meals on January 10th, 2012. What role have the village volunteers played? They have been a big help. I would say between 18 and 21 villagers and other persons who share in the ideals of the founder of TPRF have been coming every two weeks. They dig ditches, move heavy cinder blocks and bags of sand, and fill empty ditches with dirt. It is not glamorous work but it certainly helps tremendously to keep the construction on schedule. What else can you tell us about the Otinibi Villagers? Well, I can tell you that everyone is feeling really blessed and happy. School enrollments are growing daily since the project began. 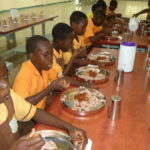 Now, we have 400 students enrolled in the Otinibi School. An Assemblyman told me he expects 100 students from four neighboring villages to come to Food for People for regular meals. For someone who has watched this program develop from afar, it almost seems like a miracle that the construction is nearing completion and Food for People Ghana will soon be open. Well, it has taken quite a lot of hard work by many dedicated people, but everyone here feels the same way. It is definitely a miracle and we are all very grateful for it! Congratulations to everyone who makes possible a better world.You are amazing!! love you! Congratulations to everyone on the team. I hope you are all feeling very proud. I enjoy seeing the pictures and hearing about the progress because all the people who contributed to this project can feel a part of it. With very best wishes! Great project… Thank you TPRF. I just wish that at some point you’ll start taking VIDEOS of all Food for People facilities and projects. If picture is worth a thousand words, video is worth at least a million. Wow, it seems like only a short time ago that I was reading about the foundation work being started. I certainly wasn’t expecting to see that so much has been completed already. 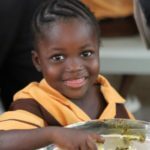 It is heartwarming to think that in a just over two months, the children & people of Otinibi will have access to a regular and nutritious source of hot meals. I bet they are all so excited.